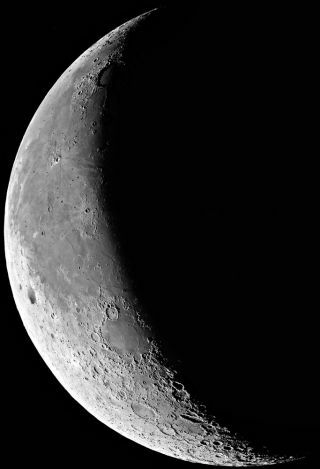 On Thursday, Sept. 10 the waning crescent moon, Venus and Mars will appear in an eye-catching arrangement in the early-morning sky. If you want to see an eye-catching celestial display involving a slender crescent moon and two bright planets, be sure to wake up an hour before sunrise on Thursday morning (Sept. 10). You might also want to make sure that you have a clear and unobstructed view toward the east, as this nice array of the moon and planets will be relatively low — only about 15 degrees above the horizon. (Your clenched fist held out at arm's length measures about 10 degrees.) So you'll need to make sure that there are no trees or buildings any higher than a fist and a half; otherwise your view may be partially or completely blocked. In the hour before sunrise Thursday morning, Venus and the crescent moon will provide a pleasing celestial tableau as they ascend the eastern sky side by side, just 2.5 degrees apart. Use binoculars to better appreciate the appearance of the full globe of the moon, its grayish-blue tone delicately interposed between the brighter sunlit crescent and dark background sky. Leonardo da Vinci was the first to recognize the faint glow of the moon's globe as Earthshine — light from the sun, reflected off Earth to the moon and then back to Earth. Skywatching Triple Treat: Mars and brilliant Venus will shine near the crescent moon before sunrise on Thursday, Sept. 10. This Starry Night sky map shows how the trio will look risking in the eastern pre-dawn sky at 6 a.m. local time as viewed from mid-northern latitudes. Finally, there is much fainter Mars. If you extend an imaginary line from Venus through the moon and continue that line for a bit more than twice the distance between the two, you will come to the Red Planet. Don't look for red, though; in actuality, Mars appears to glow with a yellowish-orange color. Mars shines at a magnitude of +1.8. For comparison, Venus dazzles at magnitude -4.5, or 316 times brighter than Mars! One of the reasons that Venus is so bright in the sky is because of its high albedo, or the amount of light it reflects back into space. This albedo comes from the permanent cloud layer that surrounds the planet; the clouds reflect about 75 percent of the sunlight they receive back toward Earth. Another reason has to do with distance. Currently, Venus is 34.4 million miles (55.3 million km) from Earth. In contrast, Mars is 230.3 million miles (370.6 million km) away — more than 6.5 times farther compared with Venus. Mars is also considerably smaller than Venus. But don't feel too sorry for poor dim Mars, for things will change in the coming months. Right now, Venus is slowly pulling away from the Earth, while Mars is slowly approaching. Fast forward to next spring: Mars will approach to within 46.8 million miles (75.3 million km) of Earth on May 30 and will glow at a brilliant magnitude of -2 — its best apparition in over a decade. Venus, meanwhile, will be completely lost from view, deeply imbedded in the glow of the sun. Editor's note: If you capture an amazing view of Mars, the moon and Venus — or any other night sky view — and want to share it with Space.com, send images and comments in to managing editor Tariq Malik at: spacephotos@space.com.